A bridge on the South Ash Grove Loop. For one day a year, all state parks in Nevada are open to the public. Discover Nevada State Parks Day was held last Saturday, and it couldn’t have been scheduled for a better day—the normally scorching June temperatures dropped and the windstorm of Sunday hadn’t yet begun. Technically, one could visit as many different state parks as you want, but generally there is only time to fully enjoy one. 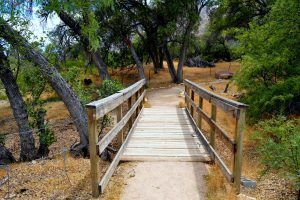 A visit to Spring Mountain Ranch State Park’s Lake Harriet has long been overdue, so what better time to go then Discover Nevada State Parks Day? 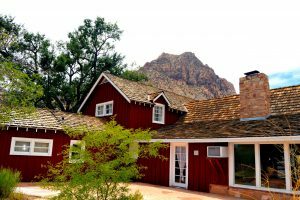 Spring Mountain Ranch is located just to the west of Las Vegas along Nevada State Route 159, in between Red Rock Canyon and Bonnie Springs. The park is home to a few of Southern Nevada’s oldest buildings, including a blacksmith shop and cabin which dates to the 1860s. There are a few great trails as well, and the natural springs that run through the area provide a more lush landscape which draws a variety of birds and other wildlife. Lake Harriet, as she currently appears. One major feature of the park that I had not had the opportunity to see before was Lake Harriet, a reservoir created when the area was an active ranch. As a Google Image search will attest this reservoir is actually a fairly large body of water for our area and paired with backdrop of the beautiful mountain range behind it, the small lake is quite photogenic. Following the directions form the parking lot, it should have only been a short walk away. After walking in the direction indicated for the lake for a while, the lake never appeared. Once the dry bed of what should have been Lake Harriet manifested it all made sense—the lake is currently dry. As a ranger later explained, Lake Harriet had been taken over by invasive crayfish which were killing off the native Pahrump poolfish colony. The Pahrump poolfish is an endangered species, and native to the Pahrump Valley (primarily in Manse Spring before it dried up); they were introduced to Lake Harriet in 1989 to help save the species from extinction. Unfortunately, someone released crayfish into the habitat a few years ago and the invasive crustaceans began eating the endangered poolfish. The crayfish were not only eating them, but also their eggs, as well as their food supply. In an effort restore the natural balance, the drastic measure of draining the lake had to be employed earlier this year. 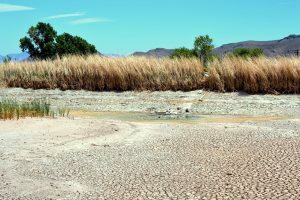 Lake Harriet is expected to be restored within the next year and a half to two years and the poolfish are currently living in a protected area of Lake Mead until they can be returned. On the upside, the main ranch house was open for the occasion, giving park visitors a chance to tour the inside. The house dates to 1948 and was once home to the German actress Vera Krupp and was later owned by Howard Hughes, although he never lived there. Besides that, the trails were pristine and a few cows were spotted grazing a field. For more information on Spring Mountain State Park, go to parks.nv.gov. The normal admission fee is only $9 per car for a day pass. For more on the Pahrump poolfish v. crayfish situation, go reviewjournal.com. The format is a little goofed up in this historic article from LLV, but here is a photo of Lake Harriett from 2004.